By Brian Hoey. Sep 2, 2015. 9:00 AM. Given the recent popularity of TV shows like The West Wing, House of Cards, and Veep, it can be easy to forget that throughout American history, the public has rarely found Washington D.C.’s political goings on particularly compelling. Case in point, before the 1950s there had been only two major works of American fiction set in the nation’s capitol: Mark Twain’s The Gilded Age (1873) and Henry Adams’ Democracy (1880), each of which was written in the mid-nineteenth century. After decades of relative indifference, however, the New Deal and the rise of Communism finally primed the reading public to latch on to the intrigue and drama that so often attended the business of the nation. When interest in the government arose, Allen Drury was prepared to fill that demand, becoming the father of Washington D.C. fiction in the process. Allen Drury’s first novel, Advise and Consent (1959) would become his most beloved and best known. 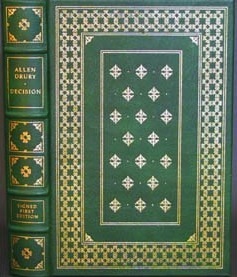 It spent more than 100 weeks on the New York Times Best Seller List and was ultimately awarded the Pulitzer Prize (despite the prize committee’s recommendation that the award go to Saul Bellow’s Henderson the Rain King (1959)), marking a rare instance in which extreme financial success aligned with critical recognition. The novel, which, along with its sequels, was eventually credited with inventing the modern political thriller, followed the trials and tribulations that accompanied the Senate’s confirmation hearings for a liberal would-be Secretary of State. Over the course of more than 600 pages, Drury conveys not just the drama that accompanies back room dealings and amoral politics, but the deeply complex minutiae that ensues in even the least contentious Senate procedures. Even from those who didn’t find Drury’s writing to be stellar, there was a wide consensus that his rendering of Washington’s rules, procedures, and intricacy were largely unmatched. Though Drury avowed that Advise and Consent was not a roman à clef, it does bear a number of similarities to the Alger Hiss trial. Not only is the political operative in question ultimately shown to have been a communist, the inner workings of the proceedings ultimately lead to the suicide of a prominent senator. Far from being a coincidence, both the similarities to historical events and the verisimilitude with which the Congressional process is rendered stem from Drury’s own experience covering the Senate for The New York Times, where the staunchly anti-communist author was witness to the inner-workings of McCarthyism and the aftereffects of the New Deal. While many author’s draw on their own life experiences for their fiction (Ernest Hemingway and F. Scott Fitzgerald come to mind), the keen eye for place and plot that Drury must have possessed remains uncommon. 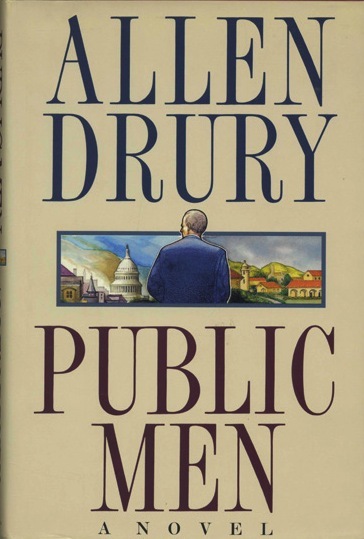 While Drury’s later works, like Public Men (1998) and Decision (1985), would never reach the level of success Advise and Consent achieved, his entire corpus is a testament to the joys of political thrillers. They are uniquely positioned to speak to impulses toward learning and toward entertainment that drive us as readers. Their stakes are high but believable, and they are enmeshed in the height of human drama. Drury was not always the most visible practitioner of this genre, but he was certainly its first and one of its most skilled.